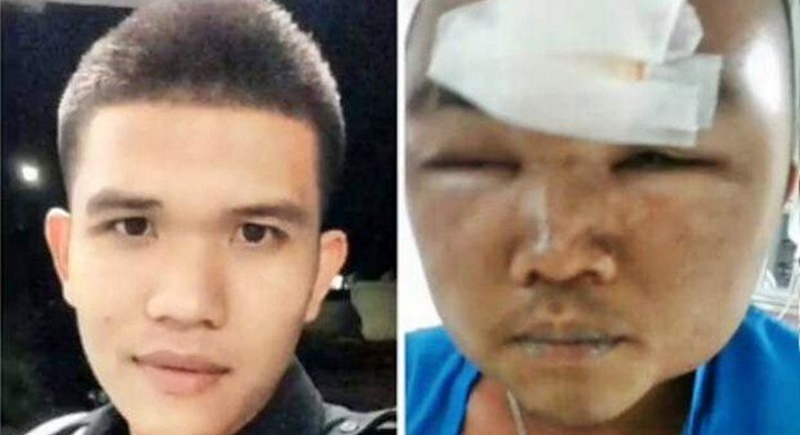 SURAT THANI: The army has ordered a probe into the death of a 22-year-old private in Surat Thani as his family suspects he was brutally beaten in a local army prison. Meanwhile, two military officers have been transferred to inactive posts following a petition filed by the mother of the private who died after he was allegedly attacked in Vibhavadi Rangsit military camp in Surat Thani. Pvt Yutthakinun Boonniam, known as Benz, who had served at the camp, was attacked during detention in a military prison for disciplinary offences, media reports said. He was taken to a local hospital following the attack last Friday (Mar 31) and was pronounced dead by a doctor on Saturday morning (Apr 1), one day after being admitted to hospital for treatment. Army chief Gen Chalermchai Sittisat ordered the 45th Military Circle to conduct the investigation and promised severe punishment for any officer found responsible, army spokesman Winthai Suvaree said yesterday (Apr 2). Col Winthai was referring to a report that Pvt Yutthakinant Boonniam succumbed to his injuries at a local hospital after being detained in the prison at Vibhavadi Rangsit Camp. “Please have confidence. If it is concluded that any officer did this, he will face legal and disciplinary actions to the full extent,” the spokesman said. The army chief will monitor the issue closely to ensure fairness, Col Winthai said. In the meantime, an army unit is taking care of the family of the victim to ensure all parties are fairly treated, the spokesman said. Maj Gen Wichai Tassanamontein, head of 45th Military Circle, said 1st Lt Thitikan Wechasit, who assists as acting prison warden for the 45th Military Circle and Sergeant Major 1st class Surachet Phommart, a duty officer at the military prison, were removed from duty. The transfer order was signed by Maj Gen Wichai pending an investigation by police and military officers. Maj Gen Wichai said he has ordered a probe into the death of Pvt Yutthakinun and formed a committee to look into the case. He appointed Col Somsak Booncharat, head of 45th Military Circle’s force, to chair the probe panel, he added. The removal will prevent military officers from interfering with investigations, Maj Gen Wichai said. Maj Gen Wichai said he urged military officers who may be ordered by police officers to give an account to cooperate fully. He insisted he will not protect any military officers, saying people who make a mistake should be punished. An investigation will be conducted in a fair and transparent manner, he added. On Saturday, a Facebook account “Bom Lung Lang” posted pictures showing a military officer being brutally attacked and physically tortured. A message was also posted online. The message read: “My cousin, who is a military officer, was detained in a military prison and was attacked by his colleagues, injuring internal organs. The user also urged internet users to share the pictures and the message as way of seeking justice for the officer. Renu Modrakhee, the mother of Pvt Yutthakinun, said she found her son with black and blue welts on his body and swollen eyes when she met him at the hospital where he had received treatment following the attack. The mother claims she was told by a military officer that Pvt Yutthakinun was attacked by people outside the military camp. Earlier, Ms Renu met Maj Gen Wichai, asking him to set up a committee to oversee the investigation into the death of her son. Last Friday, the mother lodged a complaint with Muang Surat Thani Police against the death of her son. She also asked for help from Col Sirichai Songwasin, Superintendent of Muang Surat Thani Police Station, to inspect the military camp and prison where the incident took place.